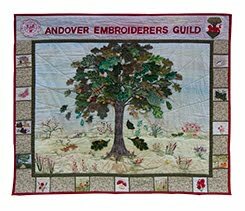 Andover Branch of the Embroiderers' Guild hosted the SEW Regional AGM on Saturday 5 October at the Weyhill Fairground. The Fairground dates back to the 13th century, when it served the needs of farmers, landowners and local people. Thomas Hardy used it as the setting for the fair in the Mayor of Casterbridge. Today it is a thriving art and crafts centre, housing a variety of high quality craft studios, a gallery and tearoom, a chocolatiere and a florist. There is also a large community hall, where the AGM took place. The hall looked bright and inviting, with a display of work by Andover members (see the Gallery page), as well as some of the rainbow squares, the Andover banner and bunting stitched by members. In addition, Myfanwy Hart (Winifred Cottage), Margaret Beal (Burning Issues) and Hilary Jenkins (Serendipity) all provided a wide range of goodies for us to buy! The AGM was conducted in the morning, chaired by Anne Walden-Mills with the assistance of Linde Merrick (Treasurer), Gill Drury (Guild Trustee) and Amanda Smith (Secretary). Sixty Guild members attended the AGM and the productive meeting was concluded after a lively discussion. After lunch Maggie Grey gave us a fascinating talk called Vanishing Tricks in which she demonstrated some of the tricks of the trade. She had us spellbound and her talk was over far too quickly! We have received many thanks for our efforts on the day and a big thank-you goes to all members of the Andover Branch for making it such a successful event. In particular, thank you for all the cakes and biscuits and to the 'catering staff' for keeping us fed and watered! A big thank-you also goes to everyone who helped set up the hall (and tidied up afterwards! ), to the ladies running the raffle and the 'bouncers' on the door! A great time was had by all.